There's a reason that Love by Message In A Bottle ® is one of our classic, best-selling gifts. Printed on the front of the bottle is a touching excerpt from Corinthians: "Love is patient, love is kind. It does not envy, it does not boast, it is not proud. It is not rude, it is not self-seeking, it is not easily angered, it keeps no record of wrongs. Love does not delight in evil but rejoices with the truth. It always protects, always trusts, always hopes, always perseveres." - 1 Corinthians 13: 4-7. This powerful sentiment will go along perfectly with the personalized message you choose to include. Rest assured that the bottle your recipient will receive is 100% genuine and authentic - unlike many of the screw-top sauce bottles offered elsewhere. 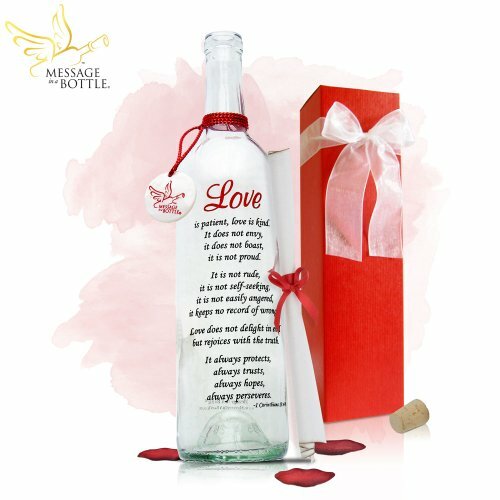 When you want to deliver an ocean of emotion, there's only one way to do it: with Love By Message In A Bottle ®! Perfect for anniversary gifts, birthday gifts, Valentine's Day gifts for her or him or for any special occasion. The bond between you and your special someone is sure to strengthen! Elegant 12-inch tall glass bottle with red silk rose petals, romantic red gift box, vellum scroll that you can personalize with your own message. Comes with hand burnt edges on scroll. Don't wait as this perennial favorite sells out quickly. Celebrate your love this Valentine's Day! Send an authentic Message In A Bottle ® from Message In A Bottle, Inc.
Unmatched attention to detail, meticulous hand assembly and unparalleled craftsmanship make for an easy to send Valentine's Day gift that will impress. Manufacturer: Message In A Bottle, Inc. Publisher: Message In A Bottle, Inc. Studio: Message In A Bottle, Inc. If you have any questions about this product by Message In A Bottle ®, contact us by completing and submitting the form below. If you are looking for a specif part number, please include it with your message.